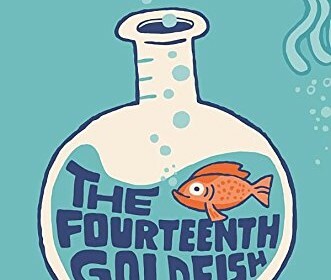 The Fourteenth Goldfish by Jennifer L. Holm is about a girl named Ellie whose grandfather discovers the T. Melvinus, which is similar to the fountain of youth. Ellie and her grandfather meet a boy named Raj, who then helps them retrieve the T. Melvinus back after her grandfather is kicked out of his science lab. During this conflict, Ellie still has to cope with her back and forth dad and her moms new boyfriend Ben. Although I enjoyed this book, there was only one problem with the story; It had no plot. The plot never hit a climax which left me feeling that the story had no substance. However, the book did have very descriptive characters. For example, Ellie’s grandfather is stubborn, grumpy, and will do anything to get the T. Melvinus back. In one part of the book, Ellie’s mom and grandfather were fighting because her mom thinks they should put the trash out in the morning, but her grandpa keeps putting it out in the night. Her grandfather is trying to take control of his daughter who has now become his legal guardian, because he is so young. As a result, Ellie’s grandfather needs to learn how to not be in charge. While there wasn’t much of a plot in this book, I would recommend it to someone looking for great characters.